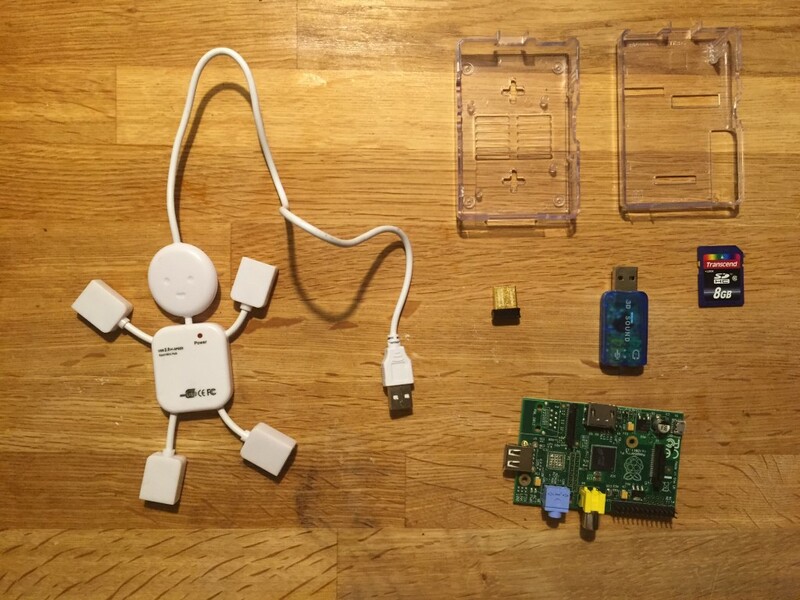 Gareth Marlow | All the tunes in the kitchen – what can I do with a Raspberry Pi? All the tunes in the kitchen – what can I do with a Raspberry Pi? 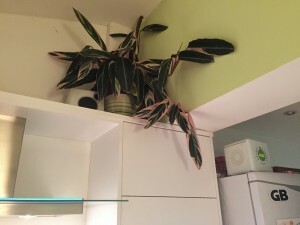 When we extended our house a few years ago, I wall-mounted a 19″ TV into the kitchen. The AppleTV 2 had just been released, and at that point it was a very cheap way of streaming video and audio over the network. 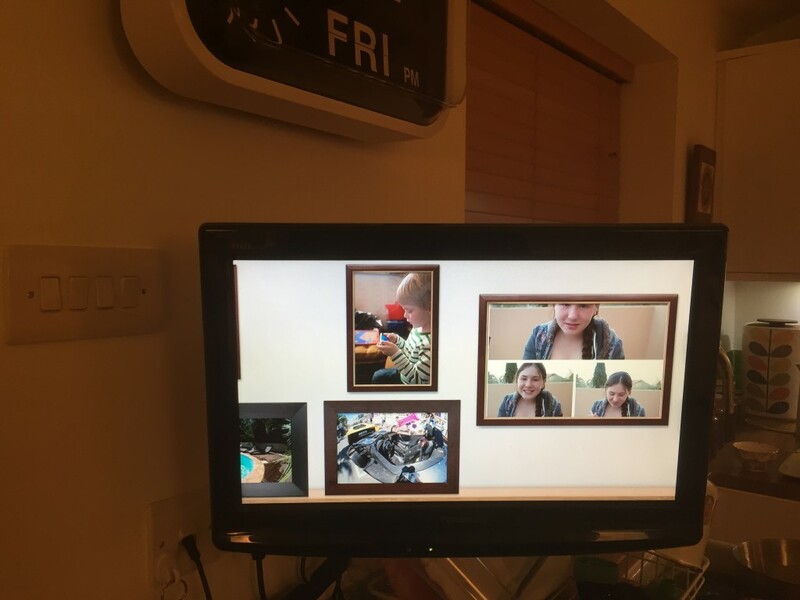 I velcroed one to the back of the TV, and when it’s not being watched, it stands in as a digital photo frame for my photos. I spent £19 the components I needed, but to buy all of the parts you’d need, start from the Raspberry Pi model B+ starter kit (£33.80) and couple it with the wifi adaptor and the USB sound card bringing the whole thing in at just under £40. Now, you can buy a Neet Wifi Music Receiver for £33 or even an iReceiver, which doubles as a wireless range extender for £17. I can’t vouch for the sound quality of those devices but with the external USB sound card, the quality is at least as good as the AirPort Express base station which cost around £55 second hand. And you’ve got speakers you can ssh into. And you’ve had a play with a Raspberry Pi. What could be better than that? You’ll also need to have available a laptop/desktop with an SD card reader, to download and install files to the SD card, an HDMI monitor or TV, and a USB keyboard. It’s quite hard to set up a Raspberry Pi without a USB keyboard, and I think this is bad. We have to give kids a way to get these machines online with a minimum of cost. I’m lucky – I work for a technology company and can borrow things like this for the weekend. We need a central service which will would build a Raspberry Pi image to your specification of wifi adaptor, and wireless credentials – and then offer it to you to download, or ship it to you on SD card – so you can just plug it in and play. Maybe one for next Red Gate Down Tools Week? Put the hardware together, and plug in the keyboard and TV/monitor. You’ll figure it out. It’s like lego. Download, burn and boot image of rasbian onto an SD card following this guide. Follow this excellent guide, Install Shairplay and get the USB sound card working. Once you’ve got this far, your speakers are up and running. Neat! But what next? The Raspberry Pi is a magic idea. Get hardware that’s small, cheap but powerful enough to go into every home, and build up a community around it of developers and educators, to use it to teach children to code. The big difference between this and the home computer revolution of the 80s, however, is that those 8-bit micros were in every home, and kids wanted them, because they were great games machines. For the Raspberry Pi to become as compelling, and sticky, as the BBC Micro, Electron, Spectrum or C64, it has to do more out of the box than it does at the moment. If there was a default domestic configuration of the Raspberry Pi which comes with case, PSU, SD card and wifi – and preinstalled with some great media player and management software like xbmc or Plex, for photos as well as video with AirPlay, seamless cloud backup, decent package management and updates… but easily extensible to run things like a Minecraft server, bittorrent client and point-to-point VPNs. This would be genuinely cool and could encourage kids to stay on the platform and hack it to extend it. In “Is raspberry pi a mid-life crisis?“, Simon Rockman argues that current teenagers have little interest in how computers work – and he’s right. But we had a big advantage when we were kids – mastery of the home computer (or for that matter, the VCR) gave us control of the TV – which came from knowing more than our parents – and so we had both the motivation and the free time to learn. Could a Raspberry Pi as the central hub of the connected home, keeping the platform open, be the killer app that kids need to get stuck in to coding and hacking like our generation did? Gareth Marlow is an old fart.